The banque d’hochelaga is a hub of history for many of the St. Albert community members, young and old. Over the years, the building has transitioned from a restaurant, to a bridal shop, to a bank and finally, in 2002, the permanent home of the Art Gallery of St. Albert. In December 2016, the Gallery’s barrier-free project was unanimously passed by St. Albert City Council and in December 2017, renovations were underway. 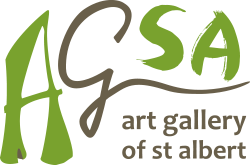 Thank you for your continued support of the Art Gallery of St. Albert! Do you have questions about the barrier-free project? Get them answered by emailing marketing@artsandheritage.ca!